It’s our 15th anniversary of Radiothon! 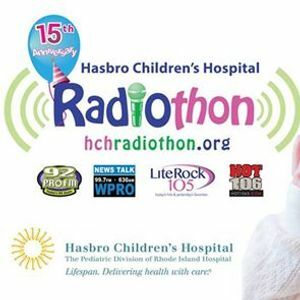 Join us on the airwaves on April 4 for the 2019 Hasbro Children's Hospital Radiothon! 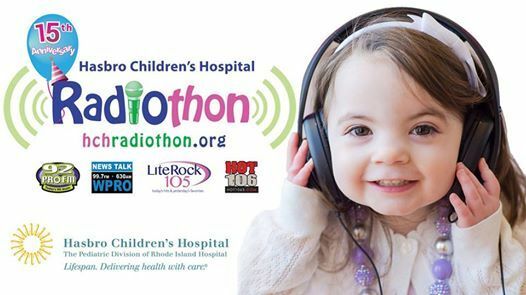 Starting at 6:00 a.m., tune in to NewsTalk 99.7 & AM 630 WPRO, 92 PRO-FM, Lite Rock 105, and Hot 106 as they broadcast LIVE from Hasbro Children's Hospital for our annual Children's Miracle Network Hospitals Radiothon! Each year, the Hasbro Children’s Radiothon fills the Rhode Island airwaves with amazing stories of courage and hope from patients, families, and staff at Hasbro Children’s Hospital. Hosts from Cumulus Providence Radio Stations – including 92 PRO-FM, Lite Rock 105, 630 WPRO and Hot 106 – broadcast live from the hospital, asking listeners to call in and pledge their support by making a one-time gift or by becoming a Miracle Maker (monthly donor). Since 2004, this annual event has raised over $8 million dollars to support the life-saving care at Hasbro Children's Hospital. When you become a Miracle Maker for the patients of Hasbro Children's Hospital, you help keep hope alive for children and families. Listen and feel the joy of making a lifesaving difference in our community! For any questions please contact Jenny Pereira at 401-444-6411 or SlBlcmVpcmE1IHwgTGlmZXNwYW4gISBvcmc=.